Machine Learning and Time Sensitive Networking in the Smart Factory: How the IIoT makes critical data available when & where it is needed. In today’s digital age, the rapid emergence of IoT is changing operations throughout the manufacturing domain. Machines and systems have become more intelligent and more connected, and the proliferation of sensors generates a non-stop flow of data. This wealth of actionable information provides the key to unlocking higher efficiency and increased reliability of machines and systems. The opportunity lies in harvesting the data. 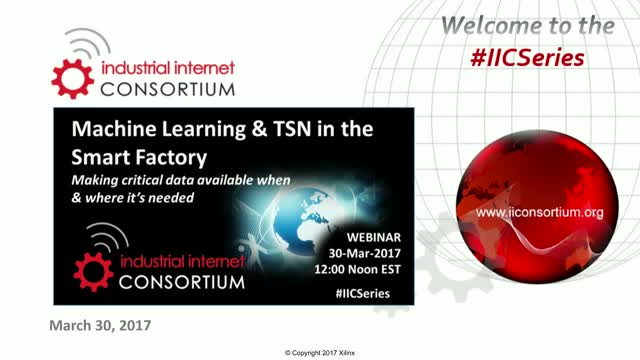 Join IIoT experts from the Industrial Internet Consortium to discover exciting developments in the field of machine learning -- products and systems taking action on their own -- and how this self-optimization will play a pivotal role in enhancing the intelligence of the factory. We will also showcase the Time Sensitive Networking (TSN) testbed and the technology used to support real-time control and synchronization of high performance machines over a single, standard Ethernet network. -How IIoT connectivity has enabled data from the operational domain (OT), to become more accessible to the information technology (IT) domain. -How Machine Learning will lead to real-time, self-optimization of Industrial Systems and help reduce downtime via predictive and preventative maintenance. -How TSN capabilities are extending standard Ethernet (IEEE 802.1 & 802.3) to enable more devices, applications, and deterministic potential to manufacturing networks.